Battery isolators are best seen as the distribution point of an automotive electric system. Generally built with diodes, isolators ensure that charge is evenly distributed between multiple batteries and the alternator. Numerous 12-volt electrical systems often rely on at least one battery to start the engine and another to power accessories. But this can become a problem when a fully charged battery is connected to a partially discharged or dead battery. The current in the fully charged battery will drain to the less charged battery, until both reach a common charge level, or even worse, discharge completely. Regardless of how many batteries are available, this current flow from one battery to another will continue until all batteries in the electrical system reach the same charge level and may prevent the engine from starting. A battery isolator can eliminate the problem of battery drain altogether. By using diodes to only allow current to flow in one direction, a battery isolator prevents a fully charged main battery from passing current to a partially charged auxiliary battery. With this setup, each battery is isolated and acts as an independent power source, allowing the main battery to conserve power for starting and essential functions. When charging, each battery determines the amount of charge it needs based on its own requirements. This control method is the best way of isolation. That said, however, the diodes used will lead to a voltage drop that's usually small, but noticeable, and should be factored into any circuit designs. Battery Separators, on the other hand, are best seen as switches that can direct current, enabling a primary and auxiliary bank of batteries to be charged from a single source, using a solenoid. When the engine starter is engaged, the battery separator compares the voltage in both main and auxiliary batteries. If the separator determines that there's not enough voltage in the primary source to perform an essential function, such as starting an engine, it will open the solenoid and allow current to flow from the auxiliary battery to make up the difference. 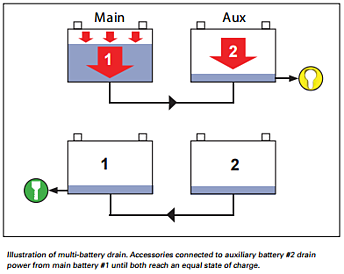 However, if the drain on the charging system by the auxiliary or main battery bank reduces the system voltage below a certain point, it will disconnect the battery banks from each other, protecting them from excessive drain. Also unlike the battery isolator, a separator will also allow current to flow in the opposite direction as well, so an auxiliary battery can recharge from the primary alternator or other source of power. Although this connection will stop when voltage reaches a certain point, the design does make it possible for a damaged auxiliary battery to drain the system, offering less protection against parasitic loads. The primary difference between battery isolators and battery separators lies in the flow of current. 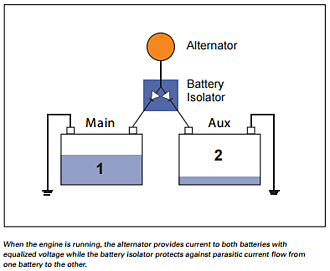 An isolator works with a diode system that allows one-directional flow, whereas the separator has a solenoid function that can choose to pull power from either source. As you can see, separators and isolators have very different jobs, and how you use them will depend on the job and your power needs. Separators are ideal for systems with a auxiliary battery, especially ones where you're not concerned about parasitic loads, or want a reliable backup system. Crucial systems with strong batteries, in particular, can make effective use of separators, especially if they need to be charged quickly. For systems with multiple batteries where redundancy is required, an isolator is likely the better solution. Isolators will ensure that no one battery drains the others in the system, offering key redundancy in a system that needs either multiple backups or needs to put several batteries on one alternator. That said, the fact that isolators charge all batteries evenly may not be ideal for some applications, and should be considered accordingly. Battery management and protection are key to a well-running vehicle. To learn more about specific products that can help improve your vehicle's battery management, click HERE. In this spirit of service, we launched the Wired2Serve® Blog to share industry news, helpful advice and other insider info to make your workdays easier and more enjoyable.